Yep, Leon '98 and Claire '98 skins styled after the original, more overtly polygonal Resident Evil 2 will be released later this year. As Siliconera reports, the skins are tied to special PlayStation Store cards in Japan, but they'll be free to everyone on March 22. Hopefully that holds true for the West as well. This mode is said to be a free addition which will be separated into episodes, with each episode adding different characters. Episode one will reportedly feature USS member Robert Kendo and Katherine, the daughter of Raccoon City's mayor. A ResetEra user also noted that the first volume is said to include a new enemy not seen in the base game. It's unclear when the first episode of Ghost Survivors will be released. I've reached out to Capcom for more information and will update this story if I hear anything. 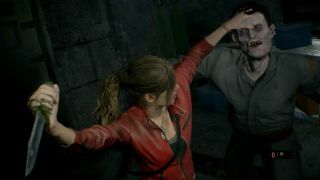 Only 26 percent of players finished the one-shot Resident Evil 2 demo - were you one of them?